Out in the Eastern Oregon desert, the U.S. Army built a massive facility in 1941 as part of its pre-war expansion program. Called the Umatilla Army Depot, this bleak spot in the middle of the desert, not far from the Columbia River served as a storage facility for ammunition and basic supplies for units in the Pacific. During the war, Umatilla housed a 30 days supply of ammunition for all the U.S. Army divisions deployed against the Japanese. To safely keep ordnance stored, the Army built hundreds of concrete igloos that still exist today. They’re like gigantic vaults with massive metal doors. Some are surrounded by berms or revetments for additional protection in case of an accidental explosion. During the Cold War, the Army chose Umatilla as a storage site for about twelve percent of the United States’ stockpile of chemical weapons. Everything from blister agents to VX gas was stored in L Block, which was sort of a base within the base complete with its own security fence and check points. Those weapons were destroyed at a purpose-built incinerator built next to L Block in the 1990s. The work lasted for years, finally finishing up in 2011. The base was subsequently handed over to the Oregon National Guard, which transformed it into the home of the Regional Training Institute. Today, the ammunition igloos are used as high ground in field exericses by the RTI’s MOST classes and NCO courses. A rifle range has been added as well. It is an amazing way to re-purpose a World War II era base, and ongoing work has upgraded the base’s new capabilities with such things as a small MOUT site. My OPFOR group of volunteers, the 973rd Civilians on the Battlefield, provides training support to the RTI’s NCO classes. We’re their bad guys, defending the MOUT site, executing simulated ambushes, moving to contact, etc. Being out there among the many abandoned WWII-era buildings is one of the most unusual experiences we’ve had. 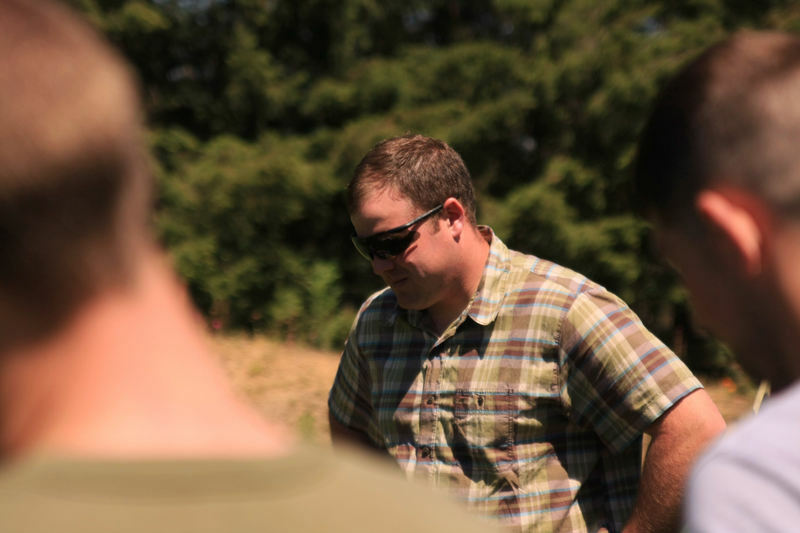 We’ve supported the RTI since 2008 when the courses were conducted at Camp Rilea on the Oregon coast. This last week, we were on the ground at Umatilla again, working with the awesome NCO’s and officers of the Regional Training Institute to help make the class experience in the field as realistic as possible. The photos here were taken during the final phases of an NCO training course. We’re looking forward to many more days with the RTI on the ground at Umatilla, rolling as their OPFOR! After ten years, the experiences on the range with these incredible and dedicated citizen-Soldiers remains among the most meaningful of my life. 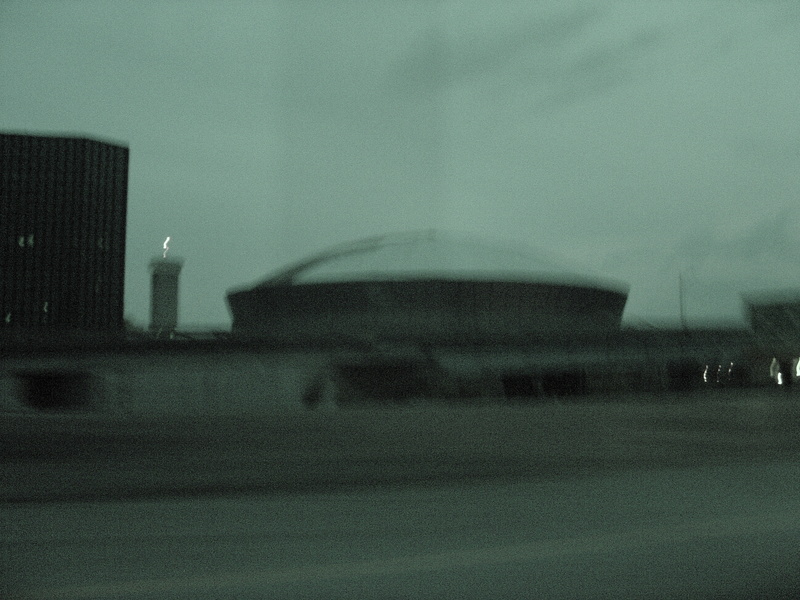 First glimpse of New Orleans, September 8,2005. The dog trotted alongside our bus as we rolled to a halt next to a small park flanked by a Mississippi River seawall. The green space here was littered with debris—downed tree limbs, trash, an abandoned grocery cart lying on its side. The wall had been tagged by some anonymous vandal who memorialized his sentiments with, “RIP. Whore Katrina.” Sort of a gang-banger version of a cave pictograph, I guess. I watched the dog lope past my window. 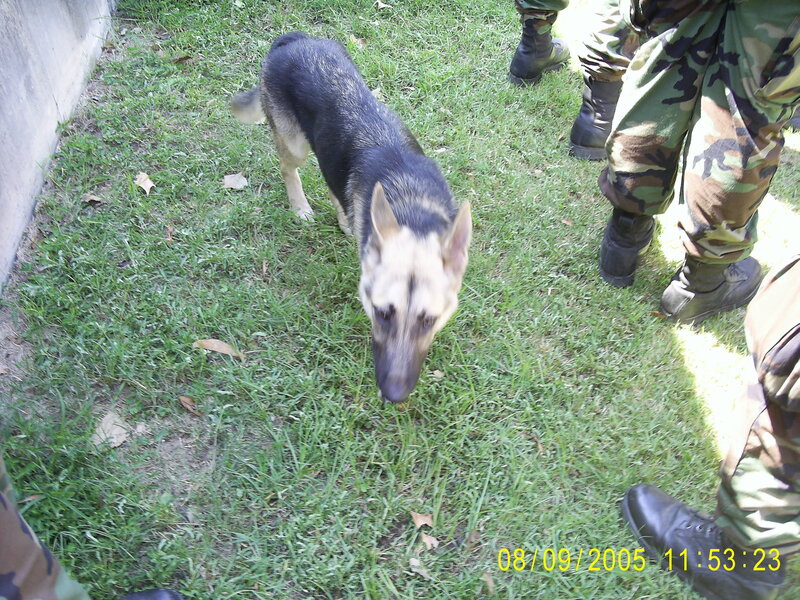 It was an emaciated German Shepherd without tags or a collar. “John…John, let’s go,” I turned from the window to see Sergeant First Class Vince “Vinni” Jacques calling to me from the front of the bus. All the other soldiers were jumping off the bus and streaming across the garbage-strewn grass. 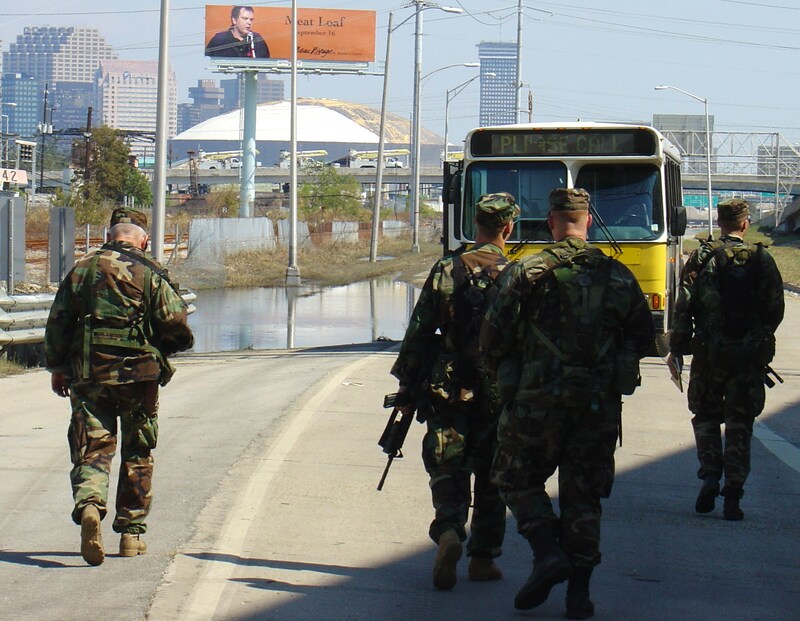 We’d been in the bus for almost three hours, drinking water and staring out at the destruction wrought by Hurricane Katrina as we inched our way from the New Orleans Naval Air Station, across the Mississippi, and into the city. On the entire drive in, we saw less than a dozen people—all but two of whom were first responders. On a street corner a few blocks from the Mississippi, a twenty-something couple sat on the curb, clothes filthy, eyes hollow and staring at us. 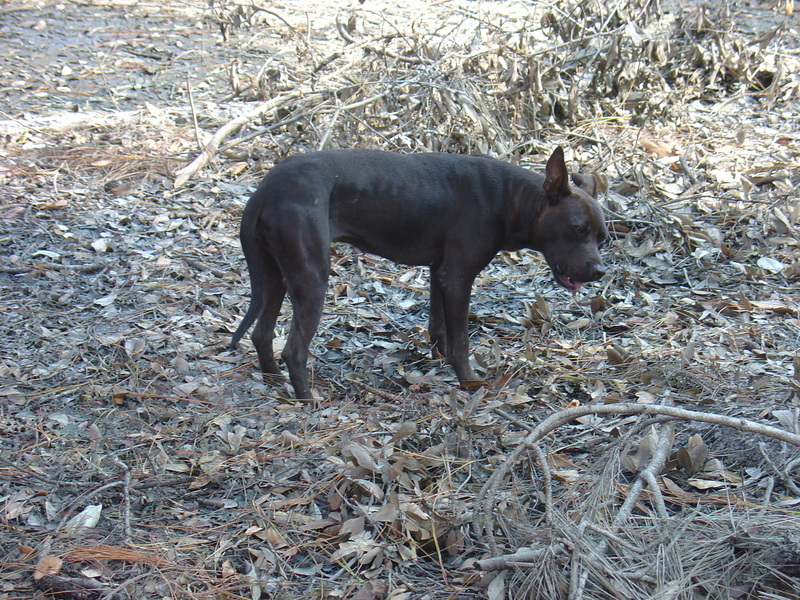 A dirty grey dog lay panting at their feet, a length of twine serving as a leash and collar. They were the only civilians I’d seen in the otherwise empty streets. New Orleans looked like the set of one of Hollywood’s last-man-on-earth epics. I followed Vinni off the bus. The heat assailed me the moment my feet touched the ground. Not even noon yet, and the temperature had to be a hundred degrees. Coupled with late summer humidity, the weather was so severe that people were dying from it as they awaited rescue at evacuation points elsewhere in the city. The day before we left Portland, the Oregonian ran a front page photograph of an elderly African-American sprawled dead in a lawn chair he had unfolded in front of the New Orleans Convention Center. Another victim of heat stroke. Then-Sergeant First Class Vince “Vinni” Jacques. Taken at the Portland Airport the evening before our departure for New Orleans. Vinni had been wounded in action in Iraq, and had served in the 1991 Gulf War in an airborne artillery unit. 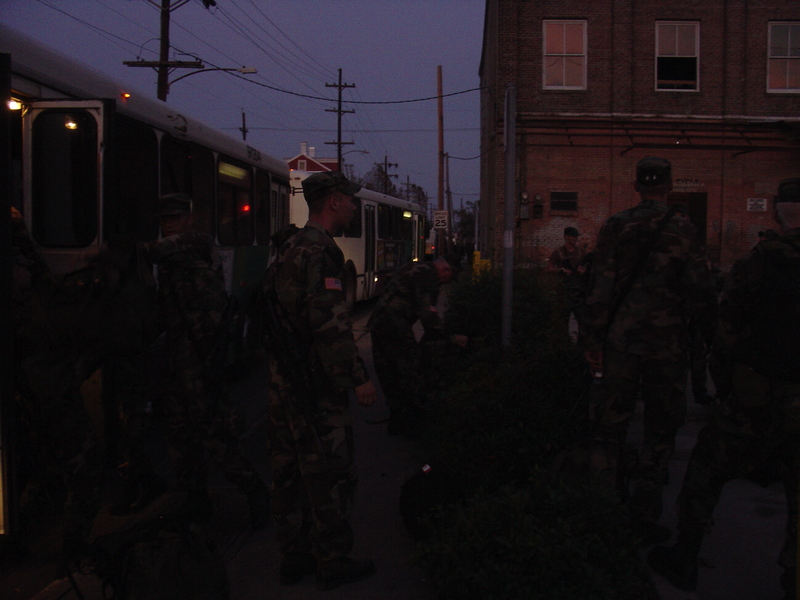 A year before, as the battalion prepared to deploy to Iraq, some of the men had taken their last leave in New Orleans. Sergeants Shane and Brian Ward had pub crawled through Bourbon Street. Late on their first night in town, Shane staggered into an alley and was caught relieving himself by two New Orleans police officers. They dragged him to their squad car, cuffed him and face planted him on its hood. Brian protested, and they roughed him up as well. Both spent the night in the local slammer. What a difference a year makes. Shane had been seriously wounded in Iraq. Brian had come through physically unscathed, but had left the Guard in the summer. Without power or running water, there was not a functioning bathroom in the entire city. This would have to do. I unzipped and let fly, feeling like a complete scofflaw. A moment later, as I walked back toward the bus, the German Shepherd padded toward me. I stopped and regarded her. She looked up at me with forlorn eyes, her ears lowered submissively. The first of hundreds of abandoned pets we found in New Orleans. “Come here, girl,” I said, urging the dog a few steps closer. Soldiers walked around her, and she glanced at each with an odd dual expression of fear and hope. She came to me and sat down. I didn’t have much food on me, just a granola bar I’d brought from Oregon. I pulled it out and tore the wrapper off. She looked puzzled as I offered it to her. A few dainty sniffs, an even sadder expression, and she took the bar in her mouth. “Better than nothing, I guess, eh girl?” I whispered to her. I lingered. I had a canteen of water, and I tried to pour some into the dog’s mouth. No luck. She finished her granola bar and waited for more. A soldier I didn’t know found an empty can in the grass, brought it over and filled it with water from his CamelBak. She drank eagerly. “John!” Vinni growled, his voice suggesting I ignore him again at my peril. I stuffed the empty granola wrapper into my pocket—I may have just defiled a public park, but I wasn’t ready to break the littering laws despite the reeking garbage that lay strewn in all directions—and followed Vinni. We pulled our bags from the bus’s luggage compartment. Each of us had a rucksack stuffed with clothing and gear, plus a duffel bag, body armor and Kevlar helmet. To this mix, I’d added an Olympus digital camera and a Dell laptop computer. Instead of searching for our stuff in the mass of identical rucks and duffels, we shouldered whatever was handed to us and walked single file the two blocks to the New Orleans Center for Creative Arts, which now served as the Oregon National Guard’s headquarters in Louisiana. At the Creative Arts Center a few hours before we headed north to the New Orleans Baptist Seminary. The CAC served as the brigade HQ for the Oregon National Guard. We dumped our gear in the parking lot, then returned to the bus to get the crates of bottled water and boxes of Meals Ready to Eat (MRE’s) that would sustain us in the days to come. Each box weighed twenty or thirty pounds and was stuffed with a variety of MRE’s ranging from chicken sandwiches to omelets and hash browns. The soldiers of 2nd Battalion, 162nd Infantry had spent a year in the heat of the Middle East. They’d fought in Najaf, Fallujah, and helped suppress the two Shia uprisings in Baghdad. They were used to this heat and knew how to measure their movements and stay hydrated. They grabbed two or three crates at a time and slung them on their shoulders. It looked easy. I picked up two MRE boxes and made it a block before the humidity hammered me. Soaked with sweat and panting like a dog, I staggered toward the parking lot. I was a middle-aged civilian, out of shape and a hundred pounds overweight. I had no experience with this sort of weather. My head started to buzz. My vision tunneled. A soldier nearby saw my face and grabbed one of the boxes. “Thanks,” I managed. Me with the Volunteers the morning before we flew to New Orleans. I went into the city weighing 300 lbs. Came out a month later down to 260. I was extremely out of shape, unfit and totally unready for the physical and emotional challenges of post-Katrina New Orleans. “Jesus!” I had a vision of myself writhing in the street as Vinni and Tommy Houston watched. Could there be anything more humiliating? He grinned at me and bounded off, carrying the MRE box like a football. I dropped the MRE box on top of a pile in the parking lot. The men had made four-foot-high walls with the supplies, providing a bit of protection from the sun. Without any further orders, they settled down to doze and chat. I found a bottle of water and drained it in seconds. Another one followed. I tried to wipe the sweat off my face, but everything I had was soaked with it. I ended up just smearing it around with my grey-blue t-shirt. Vinni had gone off somewhere. Most of the soldiers in the immediate area I’d only recently met. I stood there next to the pile of supplies, feeling terribly out of place. I was the only civilian with 2-162. SFC Tommy Houston. Gregarious, always ready with a story and generous, Tommy made sure I had the proper equipment for New Orleans. I didn’t even own a pair of boots before we left. The pair he acquired for me turned from black to green as a result of the muck we slogged through in the city. I finished a third bottle of water, then lay down in the shade of the supply boxes next to Tommy Houston. “Yeah, I’m okay. Thanks.” When the battalion received its mobilization orders, and I asked to come along, Tommy took me into the bowels of a supply warehouse and outfitted me with black infantry boots, a CamelBak, wool socks and a poncho liner that he called a “Whoobie.” This was a lightweight, camouflaged blanket that he assured me would come in handy. We made small talk until I found myself drifting. The sun rose and our meager shade evaporated. The men covered their faces with their caps and soon most of them were snoring. Movement at my feet woke me up. When I opened my eyes, I saw Sergeant Matt Zedwick grinning down on me. Known as “Z” in the battalion, Matt was a superb physical specimen. He was one of those guys who shattered the myth of soggy, out-of-shape National Guardsmen that the regular army often uses to denigrate the reservists. Matt didn’t have an ounce of fat on him, and his shoulders were wide, strong and capable. In our interviews, I’d found him to be the epitome of the modern National Guard non-commissioned officer. Matt “Z” Zedwick at NAS New Orleans the morning of September 8, 2005 before we drove into the city. 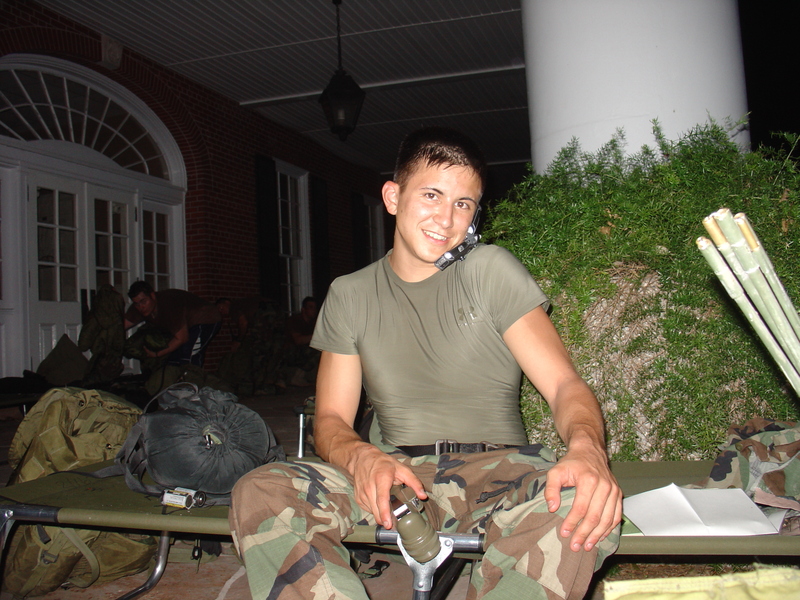 Matt was a veteran of the Sunni Triangle, the 2nd Battles of Najaf and Fallujah. He became the first Oregon National Guardsman to receive the Silver Star since WWII. After Katrina, he was a guest contestant on the TV Game Show, Deal or No Deal. “What’s up, Matt?” I asked. Without a word, he pulled a Zip-Lock bag out of his pocket and dropped it on an MRE box by my feet. He bent down and tugged its contents onto the cardboard. I sat up and saw that he’d brought me a six-inch-long dead dragonfly. He flashed another sly grin and walked away. I watched him leave, completely befuddled by this gift. In June, 2004, a car bomb destroyed Matt’s Humvee and set it afire. The gunner, Eric McKinley, died instantly. Matt jumped out and dragged his wounded truck commander clear of the burning wreck. When insurgents opened fire on them, he shielded Sean with his own body. Moments later, a second IED blew up and severely wounded Shane Ward. Despite incoming small arms fire, Matt rushed over to him and staunched the bleeding, an action Shane told me over a beer had saved his life. Matt became the first Oregon Guardsmen since World War II to receive a Silver Star for courage under fire. That’s the third highest valor award the Army gives its soldiers. I sat pondering what just happened when Specialist Joel “Stiney” Stineman strolled by and dropped another dead insect on the MRE box. Tommy and I studied it. It appeared to be some sort of black and red wasp. Another soldier delivered a second dragonfly. Soon, the MRE box was covered with dead bugs. I scooped up the biggest dragonfly and stuck it back in the Z’s plastic bag. 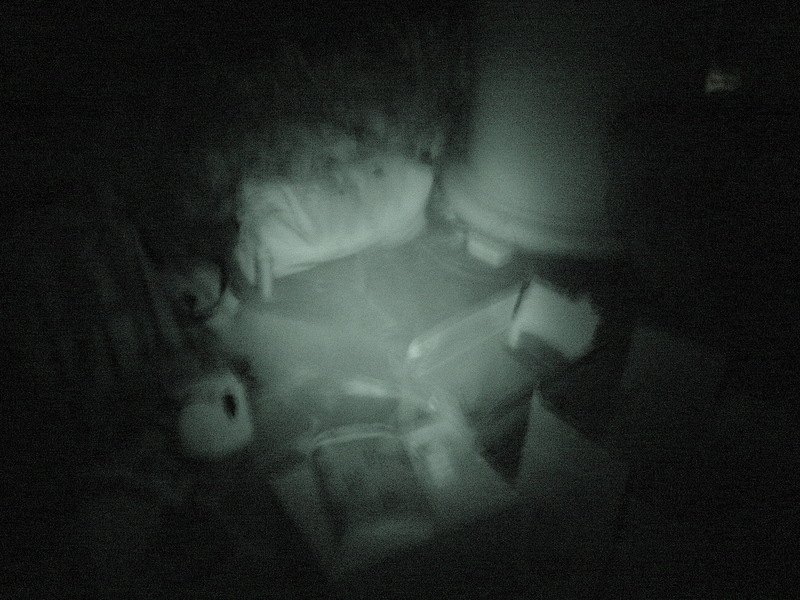 The Box of Dead Offerings. “What’re ya doin’?” Tommy asked as I stuffed the bug into my laptop bag. Vinni was a legendary prankster, and he’d already victimized me several times. I owed him, and the bug had given me ideas. “Well, go take a look at what’s sittin’ in front of the entrance to the brigade headquarters,” somebody else chimed in. The guardian of brigade HQ. I got up and stretched, feeling old and very out of shape. I walked through the parking lot to the Creative Arts center. 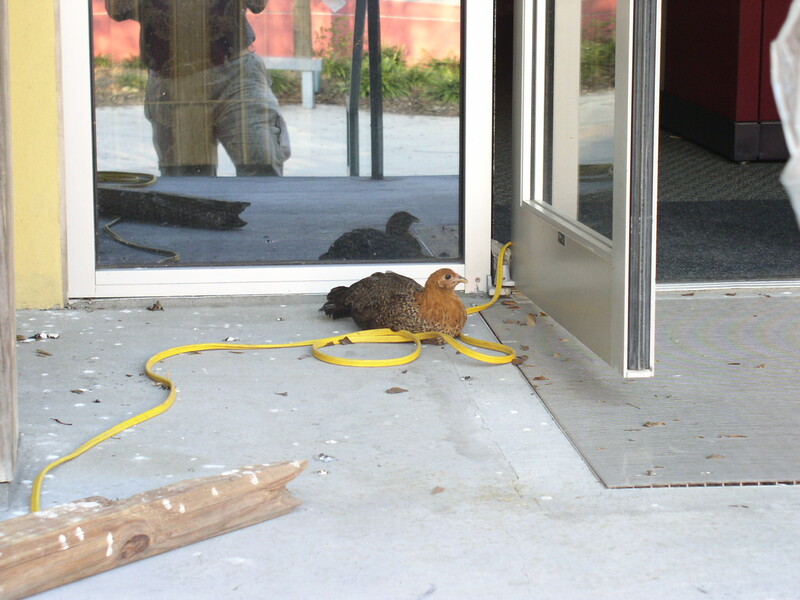 As I rounded the corner, I encountered a chicken roosting on a loop of extension cord next to the front door. The cord ran back to a gasoline generator that provided the headquarters with enough power to get the unit’s computers up and running. I walked up to it and flipped on my camera. She sat up defensively, eyeballing me as if I’d invaded her territory. Her territory? She’d made her nest at the entrance to a cultural landmark. And besides, who owns chickens in a big city? I had visions of some local voodoo doctor keeping chickens around for various love potions or revenge serums. “John, how you doing?” I turned around to see Brigadier General Douglas Pritt, the commander of the Oregon contingent here in post-Katrina New Orleans. We had met back in February, when I first approached the Guard and asked permission to write a book about 2-162’s experiences in Iraq. General Pritt confers with Captain San Miguel, commander of Bravo Company, 2-162 Infantry. “I’m good, Sir. Thank you.” I replied. General Pritt did not have the visage of a hard-bitten general, a la George S. Patton or Douglas MacArthur. Instead, he possessed a friendly face, a calm demeanor and a soft voice. He never swore, a fact that had become a legend in his command. Infantrymen have notoriously foul mouths, but woe be unto any soldier who used profanity in his presence. “Where’s 2-162 going, Sir?” I asked. “You’ll be able to see plenty from here, John,” General Pritt continued. We made eye contact, and I could see the intent behind his words. You won’t be able to do this. Not in your shape. Not with your weight. The General was giving me a gracious way out. Perhaps he was having second thoughts about allowing me to tag along. I’d spent the last six months doing research for the book on 2-162. It entailed interviewing as many members of the unit as possible; all of the documents associated with the deployment were still classified. Since February, I’d put almost twenty thousand miles on my Explorer as I drove around Oregon to speak with the battalion’s veterans. The work had taken me in some unexpected directions, including the visitation area of the Washington County Jail. 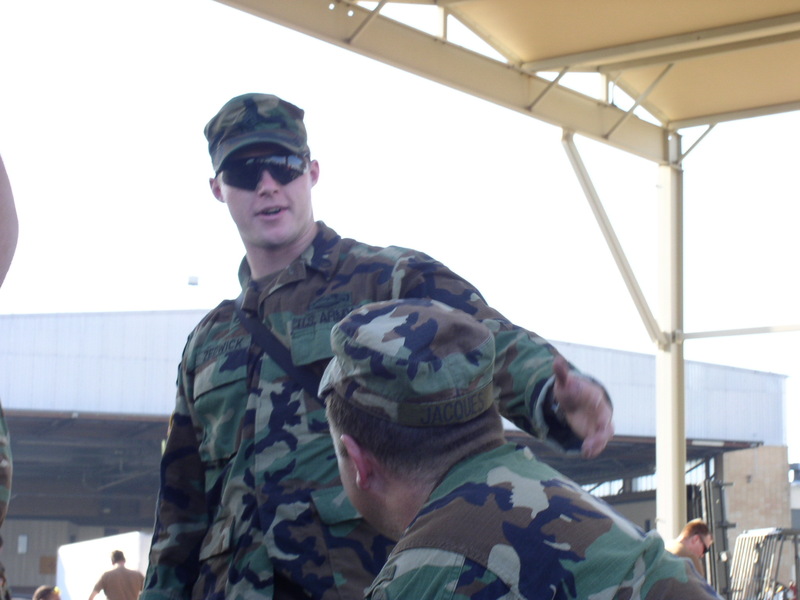 All year long, as I met and interviewed each member of 2-162, the fact that I had not been able to embed with them in Iraq weighed heavily on me. I’d only learned of the unit’s intense combat experience a month before they were set to return, so I had no time to get out there and meet the soldiers in the field when I started writing the book. Going to New Orleans could help atone for that. 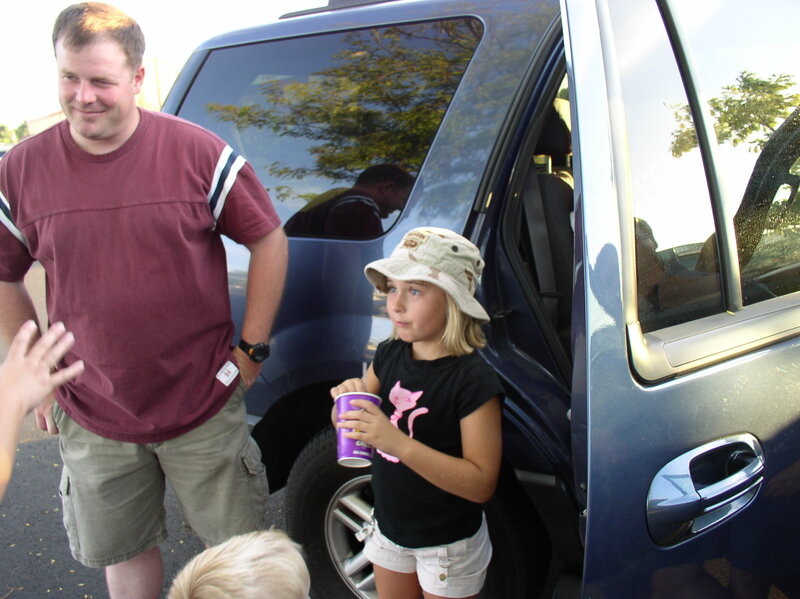 Vinni with my daughter Renee during a birthday party for my son Eddie a month before we went to New Orleans. Vinni had given Renee the hat she has on. Besides, when I called Vinni and asked him if he was going, he growled, “Hell yeah–if they let us shoot looters!” Vinni growled a lot. It was one of his most endearing features, actually. Where Vinni went, I went. In the six months since I met him, I’d become closer to him than anyone besides my wife. We’d shared stories, bonded over drinks and late night talks. I had helped write his men up for awards the army had initially denied them. In return, he paved the way within the unit for me to write the book. Air conditioning would be nice. So would hot chow. For the past three days, I’d lived off granola bars and MRE crackers. Back in 1917, when the United States joined the Great War, 2-162 became the first National Guard unit to assemble and declare itself ready for service overseas. It gained its motto, “First to Assemble,” from that achievement, and also earned the nickname the Volunteers. Abandoned city busses became our primary means of transportation from the outset of our arrival in New Orleans. The Soldiers combed the streets to find them, then got them back into working condition within a few hours. “You’ve grown close to the men, haven’t you, John?” he asked. He thought about this for a minute. Journalists stay detached, or at least they try. I was never a journalist and never really referred to myself as a writer, even though that’s how I’ve made my living for nine years. When asked, I tell people I am a military historian. Loading up for the drive north to the Seminary. General Pritt offered his hand. He looked unsure. I felt unsure. I think both of us were wondering the same thing: can the middle-aged, flabby historian hack this? He looked at the chicken as he walked back inside headquarters. She stared back, unafraid, as though she dared him to interfere. She sat up, extended her neck and clucked what must have been a curse in Chickenese. The general shook his head and smiled, then disappeared inside. The chicken would stay. General Pritt was a hard man not to like. The waiting in the parking lot continued. The Oregon Guard lacked motor transport, and we remained hunkered down around our supplies hoping that something would show up to get us out of the sun and to our assigned area of operations. When nothing did, the soldiers improvised. Small parties set forth into the neighborhood. Initially, this was just a matter of curiosity, but when some of the men stumbled across an abandoned city bus, inspiration struck. Further searches uncovered four of them, all with their keys still in the ignition, just sitting derelict in the middle of streets and boulevards. One had been driven onto a sidewalk where it had snapped off a stoplight pole. The driver had kept going after the collision until the bottom of the vehicle balanced on the pole’s stump. 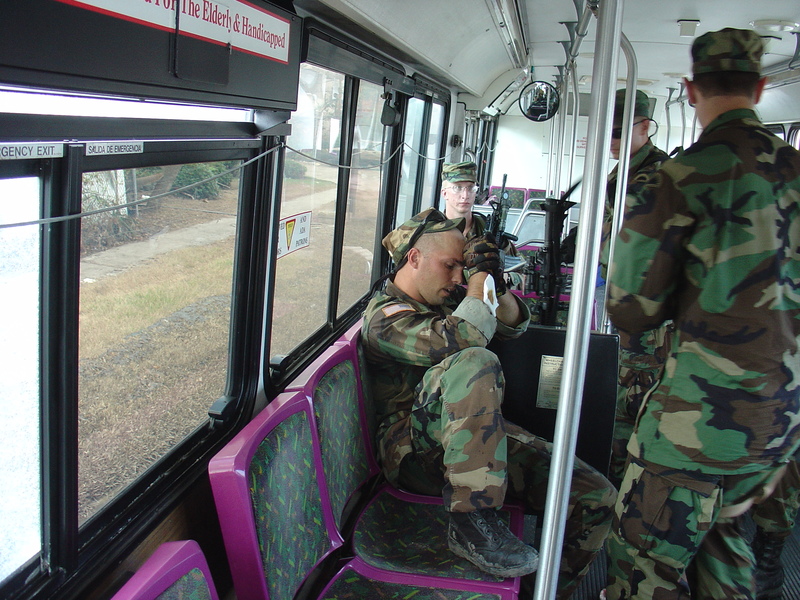 The Guardsmen, ever creative and adaptive, figured out a way to get it clear without tearing out the bus’s vitals. 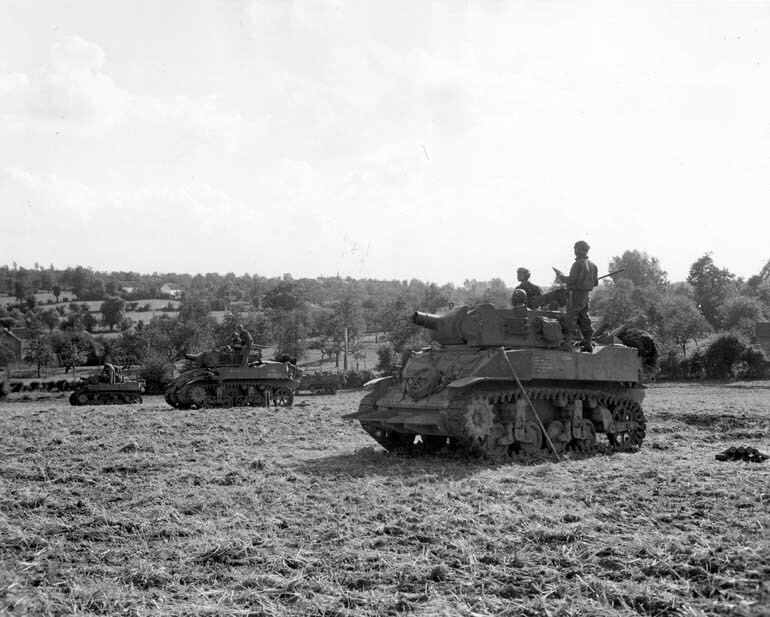 Late that afternoon, the men drove our newfound wheels to the Creative Arts Center and reported to the battalion commander, Lieutenant Colonel Dan Hendrickson, that we had our own rides at last. As dusk fell, we made a human chain from the pile of supplies to our new busses and passed box after box from one set of hands to another until everything we’d brought into the city had been stuffed inside the rigs. When we finished, our duffels and rucks dominated the back third of every bus. I climbed inside and found Sergeant First Class Chris Johnson sitting atop the pile of gear, his head sticking through an open skylight in the roof. Every other seat had been taken, so I sat down on the steps leading to the rear side door. A moment later, Stiney sat down next to me. Peering through the double doors, I saw the German Shepherd again. She had lingered on the edge of the parking lot all afternoon. Occasionally, a soldier would bring her something to eat or drink. Now, as we prepared to leave, she was nosing through torn bags of trash across the street from the parking lot. When our engines revved, she looked up morosely and watched us drive away. “Who would abandon such a beautiful animal?” I wondered out loud. “That’ll prolly be our job,” somebody added. The bus started moving. 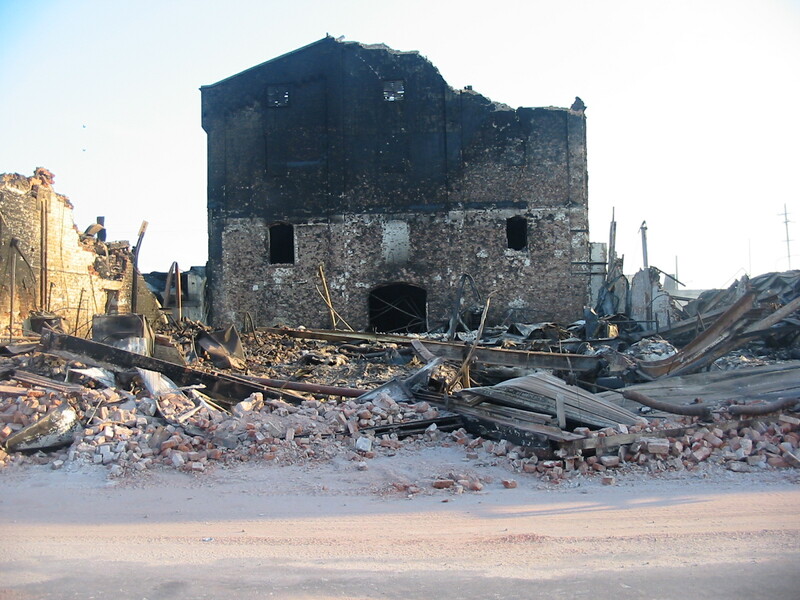 We drove east for a few blocks and came to a smoldering building. 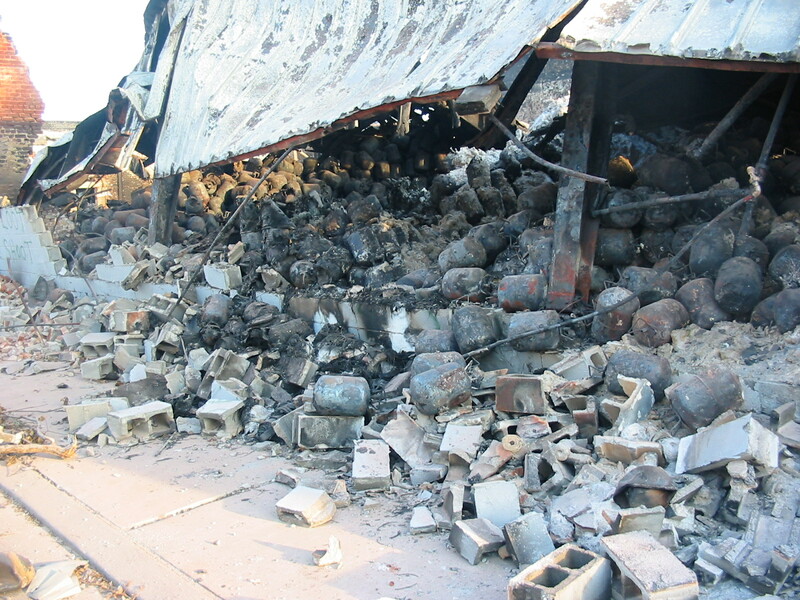 One entire side had been blown out and tanks of propane gas lay strewn through the rubble. 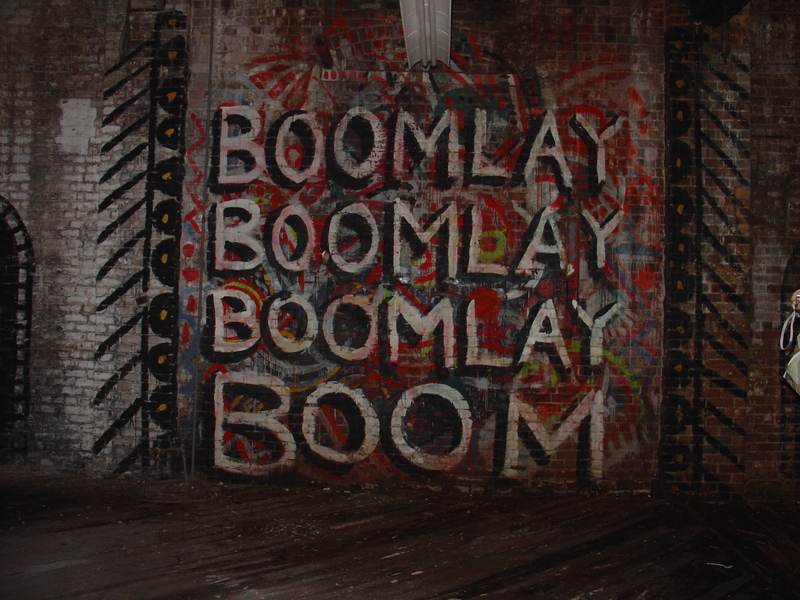 Nearby, somebody had spray-painted “LOOTERS WILL BE SHOT” on a scorched brick wall. Stiney leaned over and showed me his digital camera. “Check this out. We found a crack house up the street.” He flipped on the viewing screen and showed me photos he’d taken of the wretched place. I’d grown up in the heart of the Silicon Valley. Our neighbors were corporate CEO’s and high tech entrepreneurs. Pretention, status, materialism—those were the cultural norms I knew as a kid. When I came to Oregon, it took years to knock that arrogance out of me. What did I know of crack houses? “I’ve had an easy life,” I said, more to myself than to Stiney. “We all did. Until Iraq,” he answered. Inside the crack house Stiney found. The busses swung left up a wide boulevard. We were heading north now. “Were you there the day Vinni got hit?” I asked. Four months into the deployment, Vinni’s armored Humvee was destroyed by a roadside bomb. His driver, Kenny Leisten, died instantly. Everyone else inside suffered severe wounds. Vinni had spent the last year recovering and only returned to active duty status the day before we left for Louisiana. We sat in silence for several minutes, watching the scenery pass. “Check that out!” Stiney exclaimed. I followed his gaze to see a derelict city bus resting partly on a sidewalk. Bullet holes peppered some of the windows. We passed downed power lines draped over crushed and battered cars. At a high school, we saw trucks on their side, telephone poles snapped like pencils, and pools of oil collecting under shattered transformers. In the distance, fires blazed untended, creating crimson coronas on the horizon. We came to an intersection where cars had been hastily abandoned. Doors and trunks stood open. Some had hoods raised and belongings cast pell-mell on the ground. We found abandoned busses all around the Creative Arts Center. There were hundreds of unused vehicles that could have been used to rescue the people at the the Superdome and Convention Center. We drove on through the New Orleans sunset. 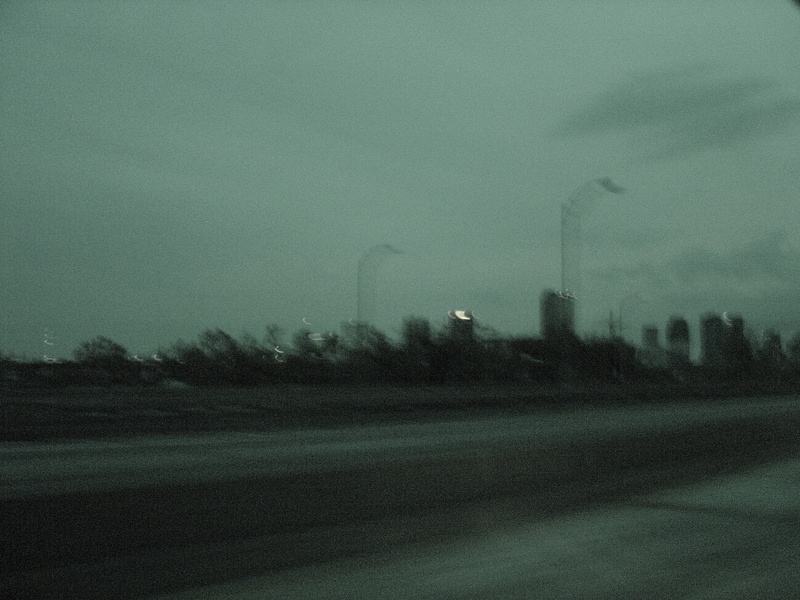 The deeper we penetrated into the city, the darker it became. Our drivers moved slowly, edging around stalled cars and random debris that clogged the road in places. A few times, we had to inch along the sidewalks to continue our journey. 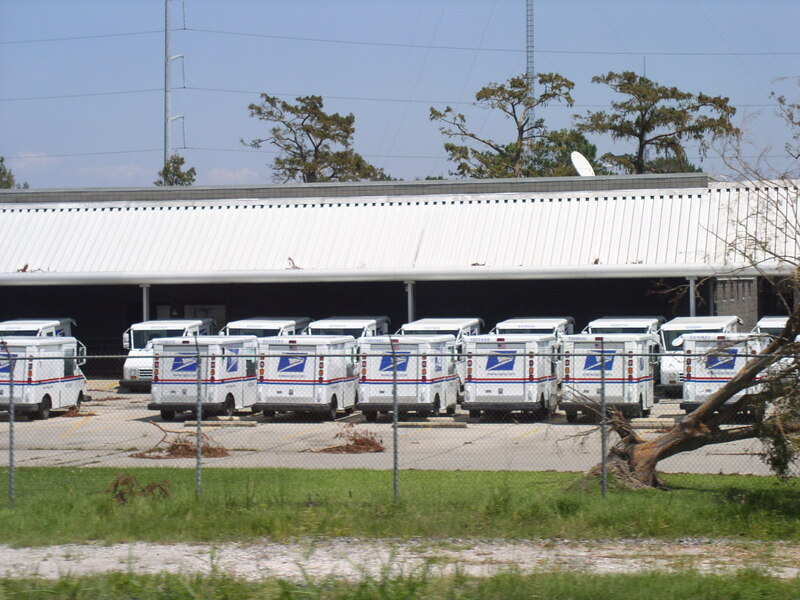 “I wonder why they didn’t use these busses to get the people out of the Superdome.” I said. Before we’d left, we’d seen Mayor Nagin’s plea for help during an interview with Geraldo on Fox News. He sounded desperate and panicky. Later, we heard him on the radio announce that he was going to stay in the city no matter what, even though the CIA was trying to kill him. Talk about delusional. Nobody was sure what to make of all this. It did make us anxious to get our boots on the ground and see for ourselves what was going on in New Orleans. The drive north to the Seminary. Another few blocks, and the busses came to a stop. We sat in total darkness, unable to see more than a few yards beyond our windows. I could make out an alley with a few abandoned cars and several downed trees. No sign of the floodwaters that had caused the worst national catastrophe since Galveston, Texas, had been destroyed by a hurricane at the turn of the 20th Century. “Stiney, you remember when we first met?” I asked in a hushed voice. Kenny Leisten’s memorial service, July 2005. I met many of the men from 3rd Platoon, Bravo Company there for the first time. Since then, I’ve tried to get back each July 28th. Vinni had invited me up to Willamette National Cemetery to pay my respects to his fallen driver on the first anniversary of his death. I met most of the platoon that day for the first time. I also met Kenny’s father, who welcomed me with a warmth that I had not expected. 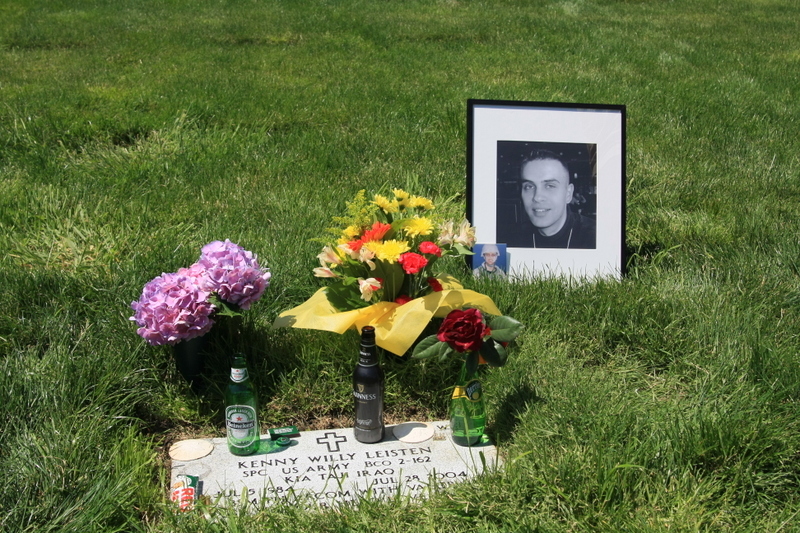 During the memorial, Vinni had produced his copy of the 91st Psalm and had read it over Kenny’s grave. The soldiers had wept as he choked through the words. “How’s that possible?” I asked through my laughter. He thought about that for a long moment. As he deliberated, a cat appeared out of the darkness. It moved slowly, hitching along on three legs. It kept its back left leg raised, and it carefully avoided putting any pressure on it. “I guess the best way to put it is that I’m spiritual without being confined by doctrine. I have my own views of God. You can’t simply believe what others spoon-feed to you. If you open yourself to God, his true reality is revealed. That’s the basis of any relationship with Him. Do you know 1 John 5:14?” Stiney finally said. I wanted to ask him where God was in New Orleans, but thought better of it. The cat hobbled into the alley and disappeared. I had volunteered at the animal clinic in my small Oregon town for three years in the 90s. The sight of this injured animal made me want to kick the doors open and go save it. For a moment, I indulged in a fantasy: if I could only get to it, I’d keep it hidden from the battalion commander and somehow get it back to Oregon. I stared into the alley, hoping to catch sight of it again. “You okay?” Stiney asked, staring at me. “How ‘bout you? You religious?” Stiney asked. “After the number of times I could have died, I have no doubt of that.” Stiney said, his voice an octave lower. “Thanks, John,” he said, smiling. Our lead driver refused to go any further. He’d learned that every convoy using this route had been sniped at by gunmen or gang bangers. Going forward in darkness into an ambush did not appeal to him. And so, we waited. The minutes grew long. Stiney and I leaned against the stack of gear behind us and got lost in our own thoughts. Forty-five minutes later, somebody prevailed on the driver to get moving again. With a lurch, our bus crept forward into the black New Orleans night. We hadn’t gone far when a pink glow lit up our bus. I stood up and looked out the windows to see a Tower Records, its neon sign miraculously still blazing. A body lay on the far sidewalk, front-lit by the store’s sign. Starving, dying and desperate animals were everywhere in New Orleans. 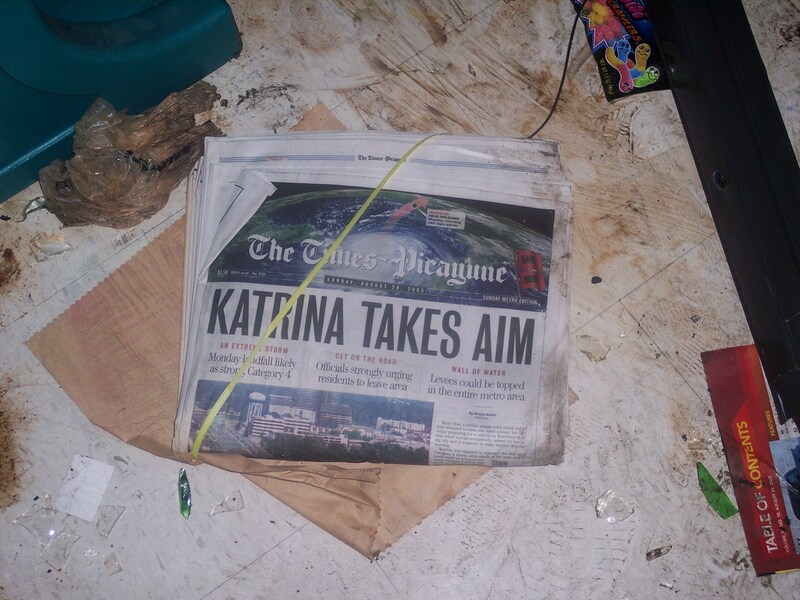 Eighty percent of the pets in the city died in Katrina’s wake. I froze at the sight, eyes locked and tracking it as it passed through my field of view. Stiney said nothing, but I could tell he was looking at it, too. Another block, and the blackness returned. I could make out the buildings on our side of the street but little else. We slowed to a crawl again and slalomed through more debris. As the bus straightened out we reached another intersection. The side street stretched beyond our view, but I saw a car squashed almost flat by a fallen tree. To our left, a small halo of red light came into view. It moved, first down, then back up, then glowed brighter, revealing a solitary figure behind it. We drew closer. It was a man, standing alone on the sidewalk, smoking a cigarette. He was the first living person we’d seen since leaving the Creative Arts Center. As our bus went by him, I saw the whites of his eyes. He was so close I could have reached through the double doors to shake his hand. He took another drag of his cigarette and exhaled the smoke. In a doorway only a few feet from the lone figure, two corpses lay, arms around each other in a last embrace. Their bodies, baked for days in the heat, looked bloated and distended, their arms and legs entwined, foreheads touching. I looked back at the smoking man who stood in the darkness next to the dead. He seemed unconcerned. “Did you see that?” I asked Stiney, trying very hard to keep the horror and panic out of my voice. “Yes,” he said in a soft whisper. My body started to shake and I did my best not to let Stiney see. If I were to earn the respect of these men, I could not let such sights affect me. At least, I couldn’t it show. “It’s like that movie 28 Days Later out there.” Stiney remarked. “Apocalyptic,” I added. I couldn’t stop shaking. The scenes of devastation rolled past our field of view. After awhile, destroyed and derelict cars became routine. So did the acres of downed power lines that festooned every neighborhood we entered. Sometime before midnight, we reached the edge of the flood zone. The busses splashed through ten-inch-deep watery sludge. Soon, the side of our rig was slathered with black muck. Streaks of the stuff slithered down the windows on our double doors, leaving a track of filth that partially obscured our view. We approached a freeway and inched onto it. Here and there we passed emergency vehicles parked nose to tail on the shoulder. A few had their lights flashing through the darkness. As we passed them, the strobe effect made me dizzy. Stiney on a night patrol a few days later, carrying the platoon’s commo gear. The freeway dipped downward and we inched onto some low ground that must have been totally submerged when the levees broke. Now, the waters had receded just enough to leave a corona of pudding-like slime at the edge of the remaining floodwater. Dead fish lay in the mud, their silver scales illuminated by our headlights. Our drivers dared to cross this flooded stretch of highway. I watched as the water grew closer and closer to our bottom step. It looked opaque. Shapes and forms bobbed on the surface, but I couldn’t tell what they were. Dead fish? Tree limbs? Then I saw the unmistakable form of a dog. It lay half-submerged near a retaining wall, the wake kicked up by our passage slapping against its fur. I closed my eyes as we went by it. The bus changed gears and sped up, slopping out of the flooded patch of freeway. The bus had grown silent–the men no longer pointed things out to each other. The silence unsettled me. I wanted to strike up another conversation with Stiney but words eluded us. Instead, we sank deeper into our own thoughts. 2nd Platoon, Bravo Company’s area at the Seminary was along the walkway in front of the music hall. Somewhere, we took a wrong turn. The convoy stuttered to a stop. The drivers conferred over crackling radios. When we started moving again, each bus executed a “Y” turn and headed back for the flooding. We splashed through it again and took an off-ramp that led us back into the city. Ten minutes later the convoy reached the New Orleans Baptist Seminary. We drove through the gates and stopped in the parking lot in front of the student union. The doors opened, and we dismounted to form another chain to get our gear off the bus. Soon, the parking lot was stacked with rucksacks and duffels. We sorted through them, reading the names stenciled on them until all had been claimed. I grabbed my gear and followed Vinni into the Seminary. Each company in the battalion had been assigned an area to bed down for the night. Charlie company set up shop in front of the cafeteria. I followed Vinni and Bravo Company around the corner to a breezeway in front of the music hall. We dumped our gear and returned to the bus to fetch the supplies. Soon, my assigned area was flanked by MRE boxes. I pulled out my poncho liner and laid it down on the concrete between Vinni and Stiney. Stiney on his cot at the Seminary. It was too hot and humid to stay inside since there was no power to any of the buildings. 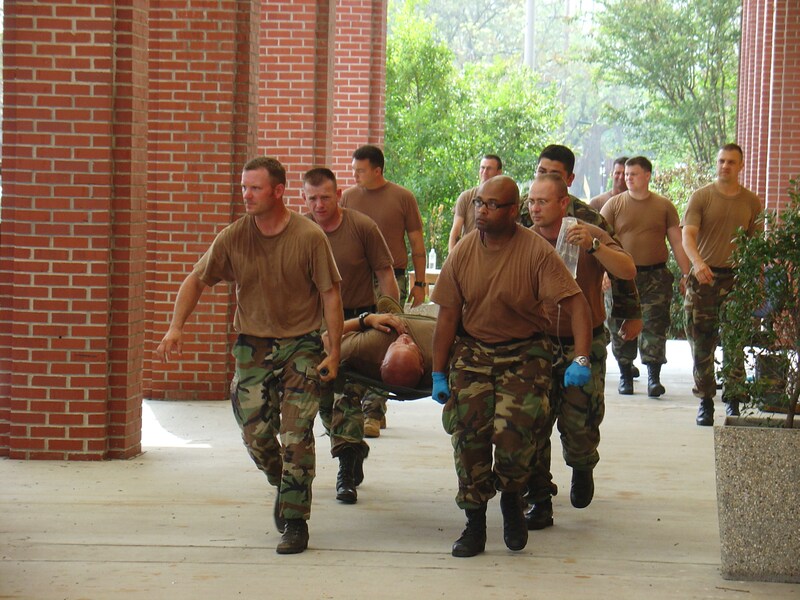 Some of the men carried collapsible cots with them. After setting them up, they tore into the MRE’s and began eating. I checked my watch. It was almost one in the morning. We’d been driving all night. I hadn’t eaten since we left the naval air station that morning. I hadn’t brought along a pocket knife, and I hadn’t learned that you can tear the Mylar covers off the MRE packages by hand. I hated asking for help, so I’d spent the last few days eating the granola bars I’d brought from Oregon. Vinni polished off an MRE then left to attend a briefing with the battalion staff. Stiney busied himself with setting up his cot and unloading some of his gear. Tommy Houston took his men over to the nearby school chapel, where they settled down on the steps. Exhaustion set in. Using my duffel as a pillow, I stretched out and started to fall asleep. Then Vinni showed up and shook me back awake. “Yeah. And a couple of dogs were seen drinkin’ the floodwater. They died horribly in twenty minutes.” He emphasized horribly. “Jesus,” was all I managed. “Okay.” I wondered if this meant bathing in the stuff. He vanished down the breezeway. I lay back on the poncho liner, Vinni’s words lingering in my head. In college, I wrote a term paper on cholera. In the last fifty years, it has been almost unheard of in the United States, thanks to modern sanitation techniques and clean water supplies. In times past, cholera ravaged communities, killing even the strongest with its brutal effects. I remember writing about its symptoms, and how the afflicted would vomit so violently they sometimes tore their stomach muscles. I couldn’t think of a worse way to die. I looked over at Vinni’s empty cot. Across the breezeway, against the music building’s outer wall, the men had formed another line of cots. Spike Olsen sat on the edge of his, shirt off, dogtags dangling around his neck. Spike had just married my daughter’s first grade teacher. My wife, Jennifer, and I had attended the wedding and spent the night dancing and drinking with many of the other men sitting around us now. You’re here because you’re connected to these men. Spike had survived both the Battle of Najaf and the Battle of Fallujah. He and I had spent hours talking about his experiences in my office, an old ballroom above an animal clinic. He was finishing school at Western Oregon University and wanted to be a cop. “What up, John? You doin’ okay?” he asked me, noticing my gaze. The first few times I had interviewed Vinni, he treated me like any other journalist. He kept it professional and didn’t share much of himself. Then one night, we got to laughing about something, and he asked if I wanted to hear some of the funnier stories about the battalion. That’s when his true personality emerged—puckish, wild, full of life. He told of pranks and parties and nights on the town before the deployment. Through the laughter, we’d become friends. And from that friendship sprang trust. During another interview session, Vinni related how his platoon had raided a house in the Sunni Triangle. In the chaos, an attached sniper team accidentally shot a woman in front of her family. In halting sentences, Vinni told me how his medic, Doc Josh Smith, tried to save her. She died in front of her family. Rather than walking away, Vinni spoke to her father and told him how devastated he was such an accident could happen. Beside his daughter’s body, the father stepped forward and embraced Vinni and thanked him for his words. After he shared that moment with me, we kept no secrets between us. What started as just another book project—my sixth—turned into something very different. I’d come to Oregon for college. I didn’t make many friends up here. My friends and family back home really didn’t understand why I stayed after graduation. Most of my high school class had returned to Silicon Valley. 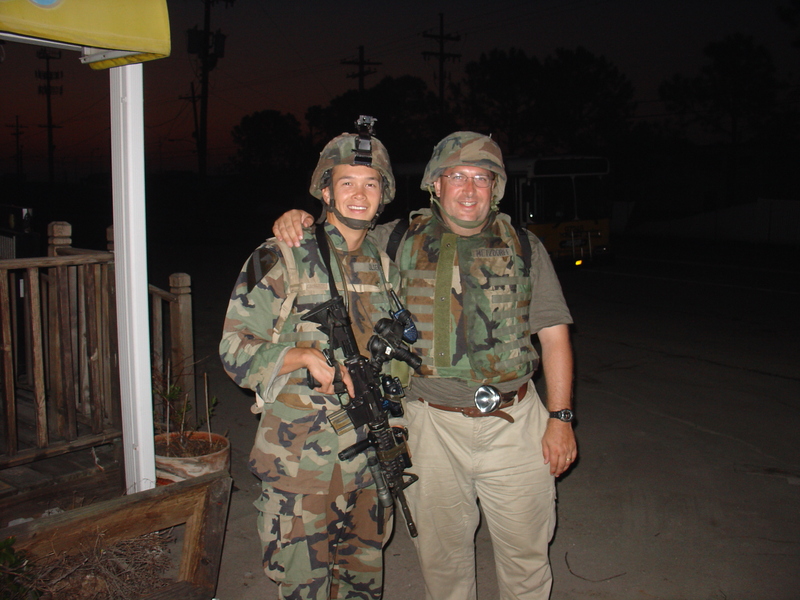 Spike and I during the company’s first night patrol in New Orleans. I was wearing borrowed body armor, which didn’t fit. No matter how hard I tried in New Orleans and Afghanistan, I was never able to master the art of tacticool. I looked like a dork tagging along with some truly exceptional human beings. Which I was. But I loved my adopted state. I stayed and worked in the computer game industry for six years before finding the courage to leave and start a writing career. In the first six months I made three hundred bucks. Where some of my classmates from home were already multimillionaire entrepreneurs, I struggled to pay the mortgage every month. It soon became hard to relate to even my closest childhood friends, and I isolated myself away in my small Oregon town. Then I met the soldiers of 2-162. Through our interviews, I discovered the non commissioned officers(NCO’s) and I shared common values, similar views and goals. We came from opposite backgrounds—most had worked their way up into the middle class while I had worked my way down—but somehow that didn’t matter. Loyalty, trust, meaning—those were the things that motivated men like Vinni, Sean Davis and Matt Zedwick. Those were the things that motivated me too, but had been all too elusive in my life for far too long. I turned over and wrapped the poncho liner over my head to protect myself from the mosquitoes now buzzing around us. Only my nose and eyes remained uncovered. I’d spent the last nine years writing about World War II and Korea from an office above the animal clinic in downtown Independence. 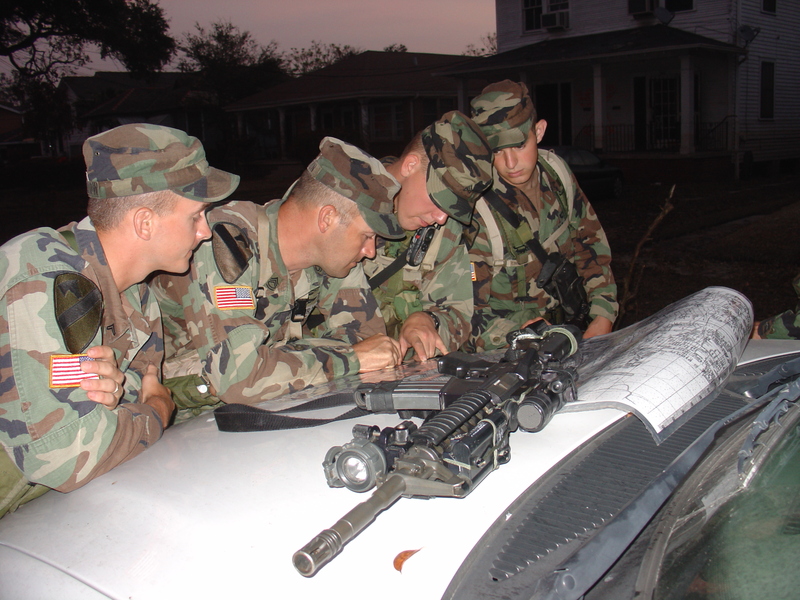 I’d never embedded with a unit before, never ventured out into the field. I had been removed from reality, steeped in the past and writing about men who, for the most part, were long in their graves. Now I’d followed kids half my age into the heart of a national disaster. I was so far out of my box, I felt utterly lost. I couldn’t explain why to myself, but I knew, no matter how hard this would become, I needed to be here with 2-162. I had to overcome my fear, though, and I’d never been good at that. But long into that first night, I stared out at the floodwaters not ten feet from my make-shift concrete bed and wondered if I had the strength to pull this off. 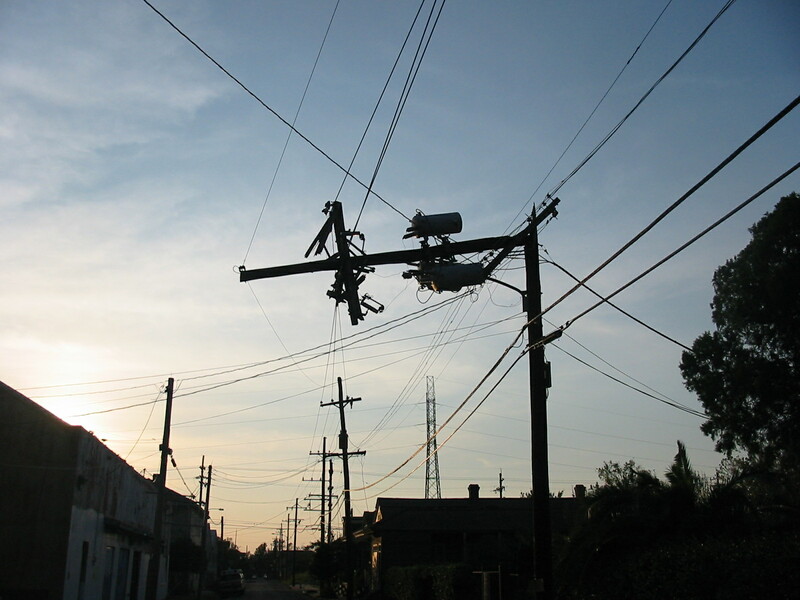 New Orleans, September 2005. 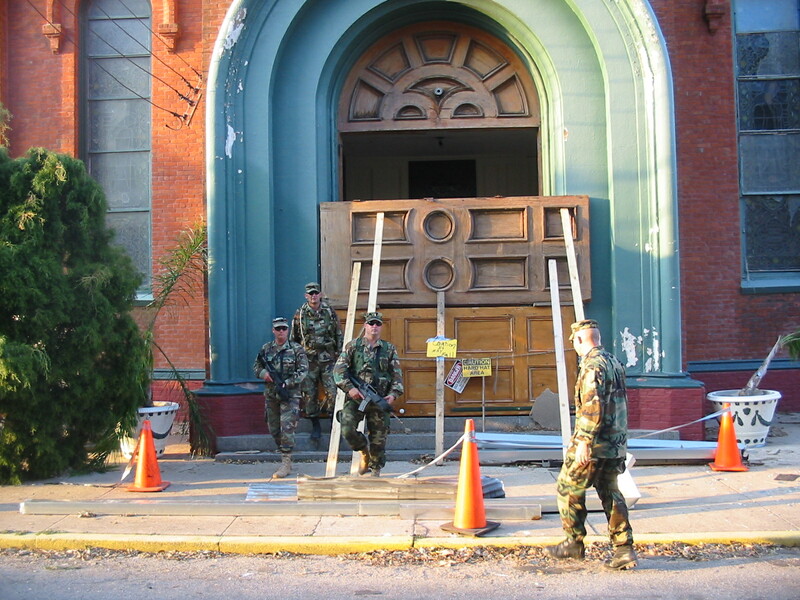 Some of my moments in the city, Post-Hurricane Katrina, when I was embedded with 2nd Battalion, 162nd Infantry, Oregon National Guard. We were in North-Central, based out of the NO Baptist Seminary on Gentilly. 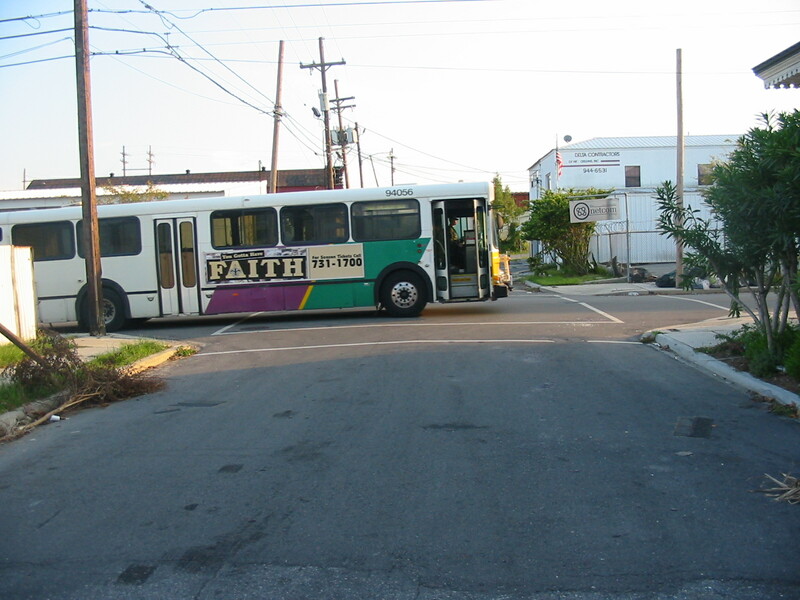 2-162 used commandeered, abandoned city busses to move around New Orleans. Hundred and three degrees. 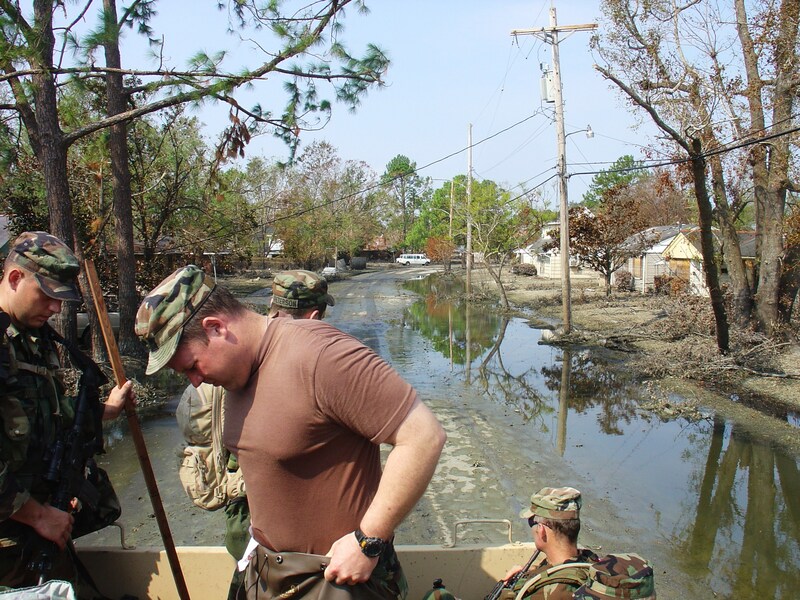 On patrol in a north-central neighborhood still partially flooded at the end of September. SSG Jason Obersinner moments before he was evacuated and underwent emergency surgery following an injury to his arm while on a patrol. CASEVAC at the New Orleans Baptist Seminary. 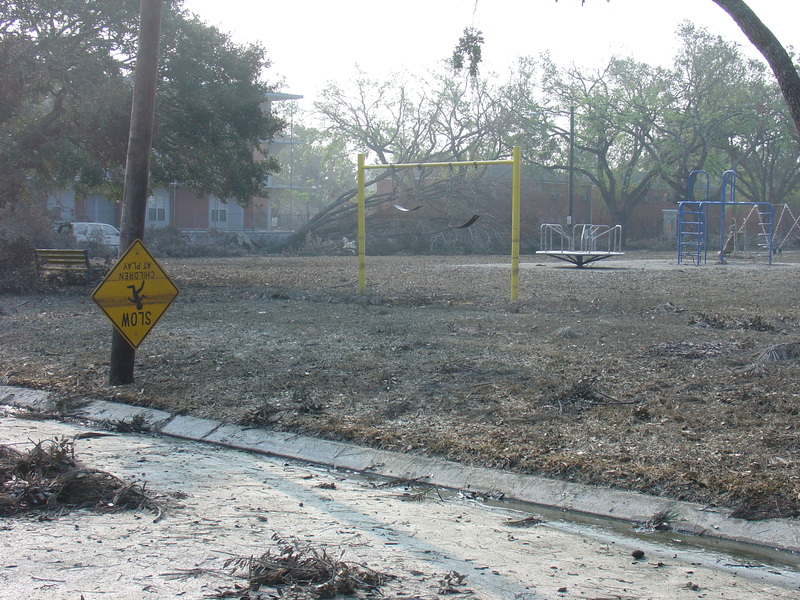 Eighty percent of the pets in New Orleans died after Katrina. They were abandoned by their owners, many left locked inside steaming hot houses or apartments. Some, like this dog, were chained to their front porches. 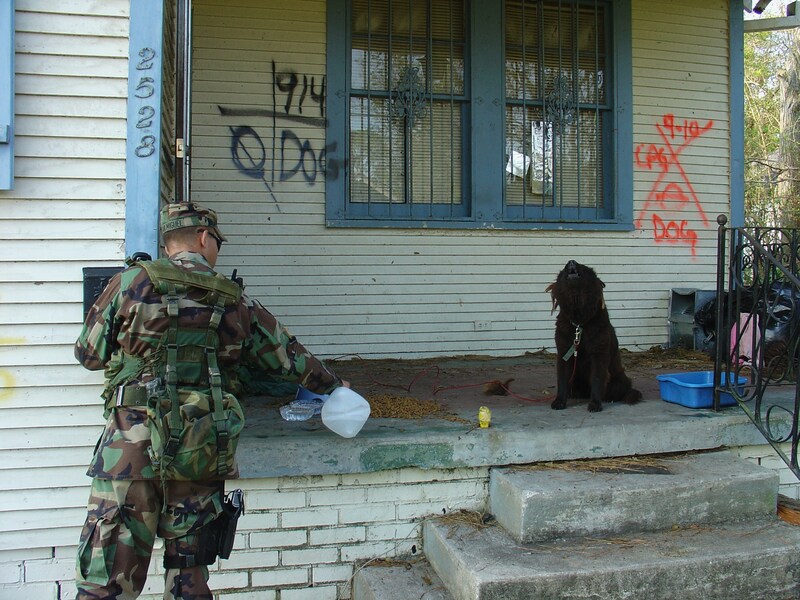 The NOPD tried to arrest the animal rescue volunteers we met who came into the city to save as many as they could.